The closer we get to Halloween, the closer we get to pumpkin craziness. 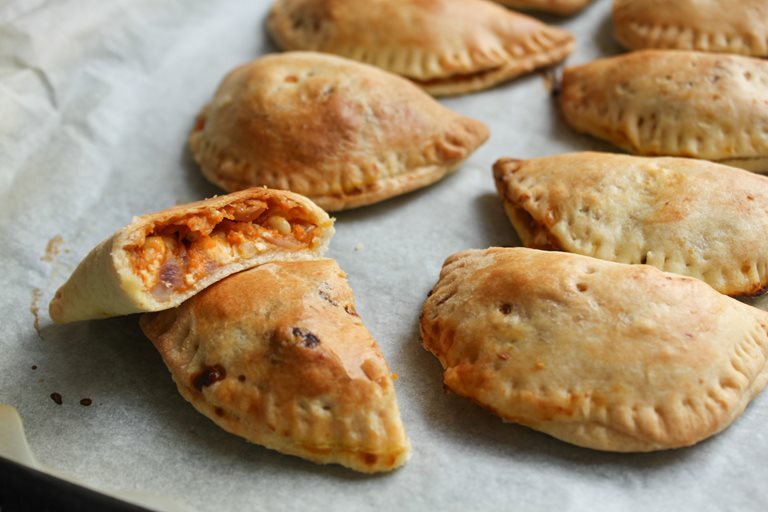 Becca cooked with pumpkin for the first time and shares a delicious recipe for pumpkin and feta empanadas. I cooked with pumpkin for the first time this week! At this time of year the Internet seems to go crazy for all things pumpkin, so I thought I'd better join in. I'll admit, I cheated a bit and used a tin of pumpkin purée - far less hassle than grappling with a whole pumpkin and then spending an hour trying to chop it up without losing a finger, cooking it, and mashing it myself. If you'd prefer to do that, you can, but I'm sure I'm not alone in preferring the easier version. Tins of pumpkin purée aren't too easy to find in the UK, but it can be done if you look hard enough - or alternatively, they can be bought online. Make sure you use 100% pumpkin, not 'pumpkin pie filling', which often has added spices and sweeteners. While that may be delicious for a pumpkin pie, I'm not sure it would go so well with feta cheese! These tins aren't overly cheap, but I managed to get three different meals for two people out of just one tin, so it goes quite far - you only need a couple of spoonfuls to get that pumpkin flavour into your cooking, and to instantly transform your food into perfect autumn fare. An empanada is basically a more exotic-sounding version of a pasty - dough or pastry wrapped around a filling. This filling can vary - empanadas are traditional in lots of different countries, each of which has their own standard filling. Pumpkin tends to be used mostly in Latin American countries. Here I've paired the smooth pumpkin with crumbly, salty feta cheese to create a snack that will keep you coming back for more! Traditionally, the empanada dough would be made from scratch, but I decided to use shop-bought shortcrust pastry - again, you could make this from scratch if you prefer, but I'm always up for a shortcut! There's something very satisfying about tucking into something that's essentially homemade, but still didn't take too long to prepare. 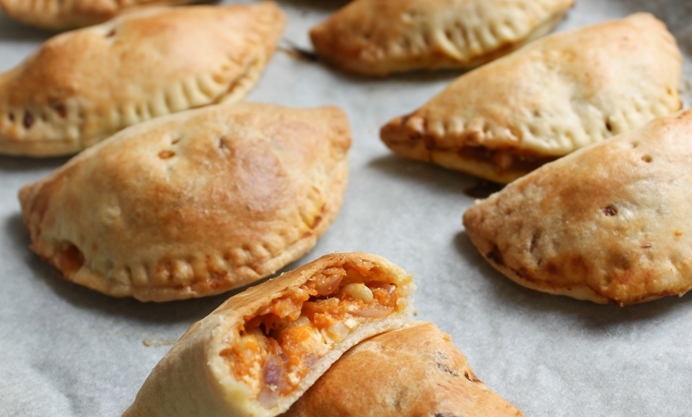 My favourite thing about making these empanadas is that they're extremely forgiving! The filling was doing its very best to ooze out of the pastry while I was folding them up, but somehow they still all ended up looking beautiful (or perhaps 'beautifully rustic' is more fitting). So it doesn't matter if you don't manage to seal them all fully - once they're cooked all your issues will be forgotten! I would recommend rolling your pastry nice and thin (I actually rolled mine out, then cut a circle, and then rolled each circle out even more) and not over-filling them - just a heaped tablespoon or so of filling in each. Each empanada is quite small, so you'll need a few each - feel free to scale up the recipe! They're very moreish so you won't want to run out too quickly!